In 1909 Robert Peary, his partner Matthew Henson, and four Inuit reached the North Pole. They were recognised as the first, although there is controversy surrounding this claim, as some believe the men missed the North Pole by miles. Following many further failed expeditions, by sled, balloon, airship and ship, the Pole was next witnessed in 1926, but it was in 1948 before anyone actually stood there. The Arctic is not a continent; it is a dynamic environment of polar sea ice. We will be trekking on skis pulling a 50kg sledge for around 8 hours per day, in the process encountering many challenges and breath-taking scenery. If conditions are good it will be across large pans of flat ice that present few obstacles. When conditions are less favourable we will have to manoeuvre around open water leads and over pressure ridges that can range from 1-5 meters in height. The North Pole is one of the last true wildernesses in the World. The Barneo base camp is set up by first airlifting a bulldozer on to the ice, creating a runway, landing a plane with the equipment and building a base camp for the duration of the one month North Pole season, April 2016. The whole challenge takes place on the frozen ice on top of the Arctic Ocean. The ocean ice pack is moving and the ice can and does crack causing open leads and pressure ridges. The moving ice pack has implications for journey times. If it moves in our favour (towards the North pole), we will have to walk less distance to reach the Pole. If it moves against us, we can go to sleep and wake up to find ourselves with a few hours walk just to get back to where you were the night before! Once on the ice, progress will depend on the weather conditions, the physical state of the group, whether the ice is flat or broken up, whether we encounter any leads (breaks in the ice) or encounter polar bears. Yes polar bears. The North Pole Expedition is a full-blown expedition – there are elements of self-sufficiency, decision-making, team-work, ice travel. The expedition meets in Svalbard’s capital Longyearbyen, on the island of Spitsbergen in Norway. After preparations and outfitting with the Polar Clothing and Equipment Pack, we fly 2.5 hours by Antonov-74 aircraft to Barneo Ice Camp. At Barneo we board the Mi-8 helicopter and fly south to 88 degrees north, over 200km from the North Pole. Temperatures range between -20° to –35°C. Towing our own sleds, we set off towards the North Pole, spending 3 weeks on the Arctic Ocean, living from our supplies, surviving on our wit. This is a true Arctic Ocean expedition, alone against the elements, challenging the drift, overcoming the constant obstacles. The success of a North Pole expedition lies in the ability of a team, and its individuals, to adopt a rhythm of polar travel. Daily routines are established, both in and around camp, and during the hours in the harness, to ensure the expedition moves north safely, efficiently and happily. Each person becomes an integral part of the team and lends a hand in every aspect of the trek, from cooking to route-finding to watching out for polar bears. After 20 or so days we reach 90 degrees north and celebrate our arrival at the top of the world. We get a satellite phone call from the pole to our families. To top it off we may camp at the North Pole before being collected by helicopter the next day. The whole challenge covering over 200km can take around 21 days of walking and skiing on sea ice and snow tackling pressure ridges, open leads and the extreme cold. 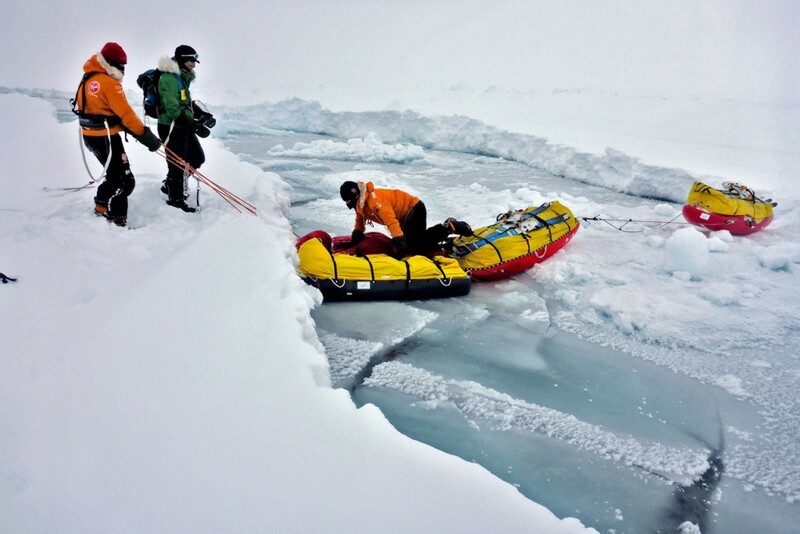 The expedition is well organised and led by an expert polar guide – whilst remaining highly challenging it is not high risk.